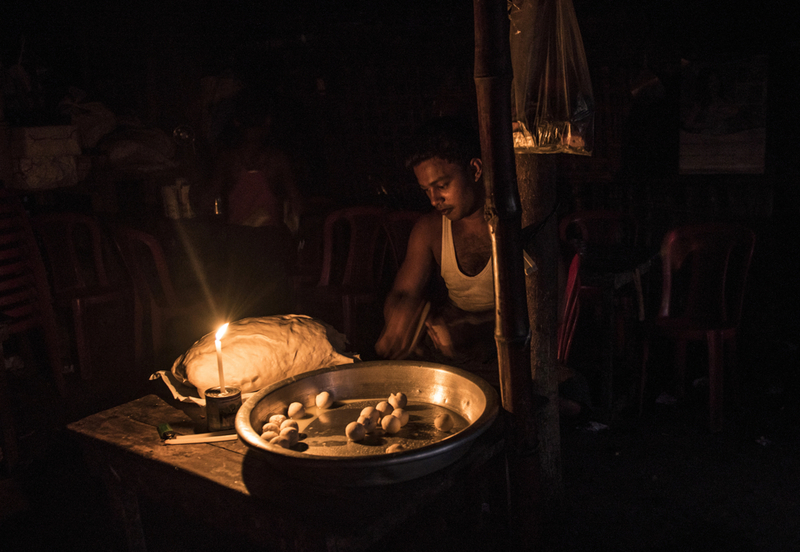 A Rohingya man, Burmese Muslims, sells food at a stall at night in the Thay Chaung camp for the Internally Displaced outside of Sittwe, which houses nearly 3000 people, November 23, 2015. There are limited opportunities for the Rohingya to work and make a living to support their families, as they are unable to travel outside the camps. An estimated one million stateless Rohingya have been stripped of their citizenship in Myanmar, and forced to live in modern-day concentration camps, surrounded by government military checkpoints. They are not able to leave, to work outside the camps, do not have access to basic medical care, or food. Most aid groups are banned from entering or working in the camps, leaving the Rohingya to their own devices for sustenance and healthcare. Journalists are also routinely denied access to the Rohingya, Myanmar’s way of ensuring the world doesn’t see the slow, intentional demise of a population.